Ever wonder what happens when some of the fastest men and women in the area get together? We’ll tell you what – GrindFest – an opportunity for the fastest of the fast in the MKE area to duke it out and see who can last the longest in a progression run at the Pettit National Ice Center indoor track. When: Sunday, Dec. 27; Women’s race starts at 7:30pm. Men will start around 7:45pm. Who: Everyone is welcome! Ladies will start around 6:30 pace and grind down from there. Men will start around 6:10 pace. Below, Grind Master Thomas Breitbach explains how it works and shares a few favorites for this year’s race! How did GrindFest get its start and how many years have local runners been grinding it out at the Pettit? GrindFest started in 2013, so this is the third annual ‘Fest. The event is the brainchild of Terry Witkowski (Kettle Moraine HS alum and an All-American at UW-Stevens Point), and has continued to grow from his original vision. We’ve added team scoring competitions, a prediction contest, and even more prizes to make this THE most exciting indoor progression run held between Christmas and New Year’s in the Milwaukee area! Can you explain how the event works? Participants start running … and then what? 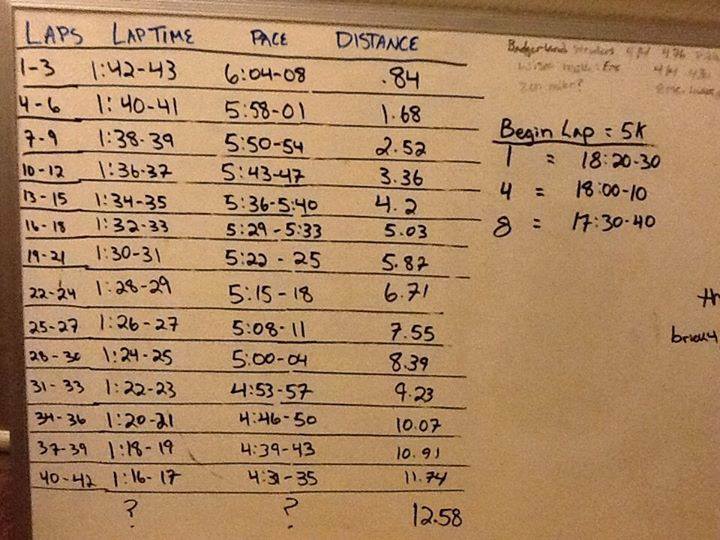 Basically it’s a progression run where the pace drops by 2 seconds per lap (about 8 sec/mile) every 3 laps. Participants keep running until they can’t keep up with the pack and the pace. After you’re done, you can pull off the track and watch the rest of the race unfold. Once it’s down to two athletes left, it’s a 3-lap race to the finish! What are the rules participants need to follow? Other than having to stay running with the pack (you’re allowed to drop behind a little bit once or twice, as long as you reconnect pretty quickly afterwards), it’s fairly simple. If the leaders of the lap are more than 2 seconds faster or slower for the assigned pace, they will be warned. After 3 warnings, you’re out. That’s never happened yet, as it seems like people get into the rhythm pretty well as things get rolling. We also have a one-time, one-lap bathroom break allowance, though only one person has successfully pulled it off. From what we can tell, there were some seriously fast guys in the mix last year. Who are the past winners? What final pace/how many laps did the winners run? Our first GrindFest Champ was John Dewitt, a UW-Oshkosh All-American and local math teacher who is an Olympic Trials qualifier in the marathon (2:17:38 at Chicago in 2014). 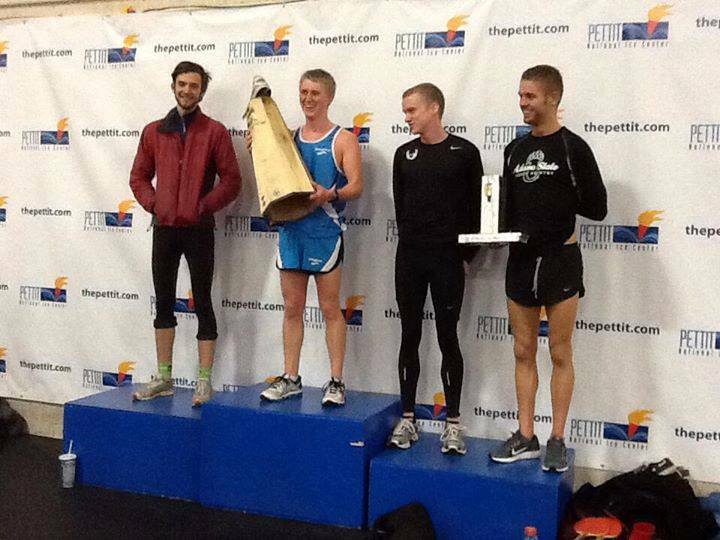 Last year, John finished second in an epic duel with Joe Stilin, a 2008 Milwaukee King HS grad who is a sub-4:00 miler and current professional runner in North Carolina. In the first two races, we’ve usually seen the champion determined after about 10-11 miles of running (about 38 laps), finishing up with a last mile around 4:45. Has anything crazy or unexpected happened in any of the previous years? Major upsets, etc? Probably the most legendary GrindFest story comes from 2013. John Simons, an Arrowhead HS alum and also a sub-4:00 miler, pulled off the track for a “1-lap pit stop” and rejoined the leaders running right around 5:00 mile pace to finish in the top 5 of the inaugural GrindFest. I think we can all relate to that feeling, and John did it in pretty impressive fashion! We’ve heard there will be a ladies division this year – can you tell us a bit about it? How will it differ from the men’s event? The women will run 9 laps of the track on their own, starting just over 6:30 pace, and then progress down every 3 laps, until the men jump in at ~6:10 pace for their start. Who’s already in for this year’s event? Any favorites in the mix? With Joe Stilin unable to return to defend his crown, I think John Dewitt is a strong favorite at this point, though I know some other local studs are primed to push for an upset. Andy Ashenden was a surprise 3rd place finisher last year; Spencer Agnew is a Marquette grad with some pretty serious finishing wheels. My personal dark horse pick is Kyle Fraser, a former Badger cross country athlete and winner of this year’s Lakefront Marathon. That dude was born to grind. On the women’s side, last year’s groundbreaking first female participant (and self-proclaimed Ruth Badur Ginsburg of GrindFest) Molly Woodford should be one of the top contenders. In addition, 2013 Wisconsin state cross country champion Elizabeth Flatley will no doubt be ready to grind. We’re hoping to land a few other high-profile athletes to the women’s field, and I wouldn’t be at all surprised if a few of our ladies out grind some of the men in the race! Absolutely! The spectators are such a big part of what makes this race truly an event. In addition to the thrill of the race, we’ve got a prediction contest, spectator spirit awards and even the coveted “Mom of the Year” prize. If you like running and runners, this is one of the most fun nights of the year! Feel free to check out our website at thegrindfest.com and contact us if you’ve got any questions. Looking forward to seeing a bunch of great folks at the race! Thanks for chatting with us, Thomas! Who’s running this year’s GrindFest? We’ll see you on the 27th! 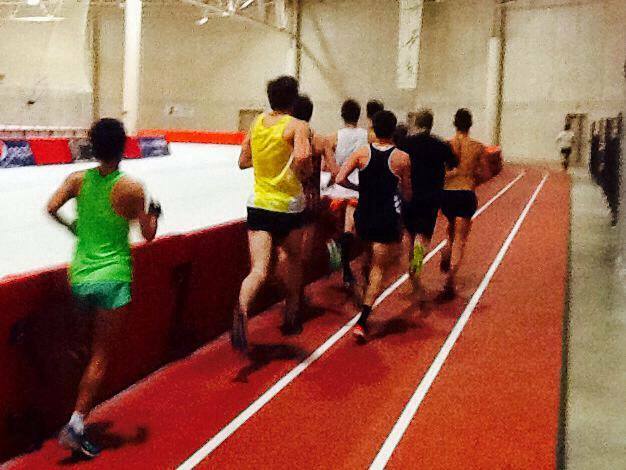 Who’s In for the BLS Indoor 20k? Who saw this week’s announcement that registration is now open for the Badgerland Striders new Indoor 20k at the Pettit National Ice Center?? We’re mega stoked about this race! First off, it’s a 20k (about 45 laps), which is an unusual distance in this area so a great opportunity to race something different. Second, what’s not to love about a course that’s pancake flat with guaranteed 50 degree temps and no rain, snow or ice? 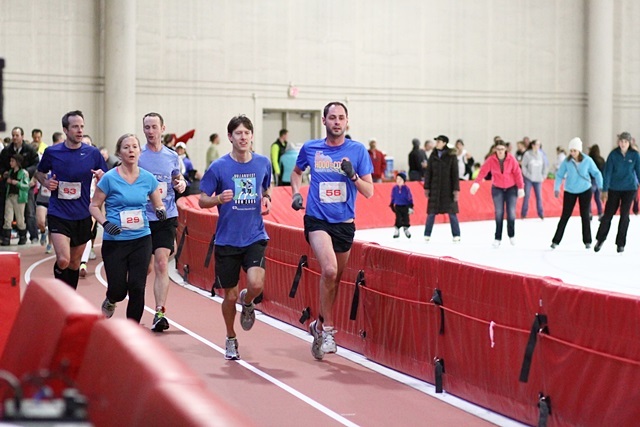 Third, this is a perfect opportunity to run on the new indoor track and a great way to train for January’s Indoor Marathon races. Additional details: All registered participants receive a tech t-shirt and snacks and beverages after the race. The course is supported with water stops and restrooms. Awards will be given to the top three males and females in each heat as well as the top male and female in each age group.